The Shepherd Young Memorial Scholarship was established by contributions from colleagues, former students, and friends in memory of Shepherd Young following his death in 1940. Mr. Young served as a faculty member from 1918 - 1940, founding the Department of Commerce at ISU in 1918. 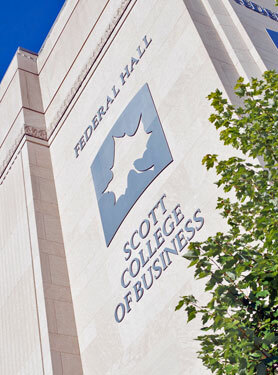 The Department of Commerce developed and expanded over later years to become the ISU Scott College of Business. Prior to joining the ISU faculty, Mr. Young was a teacher and administrator in Kentucky, West Virginia, and Indiana schools.